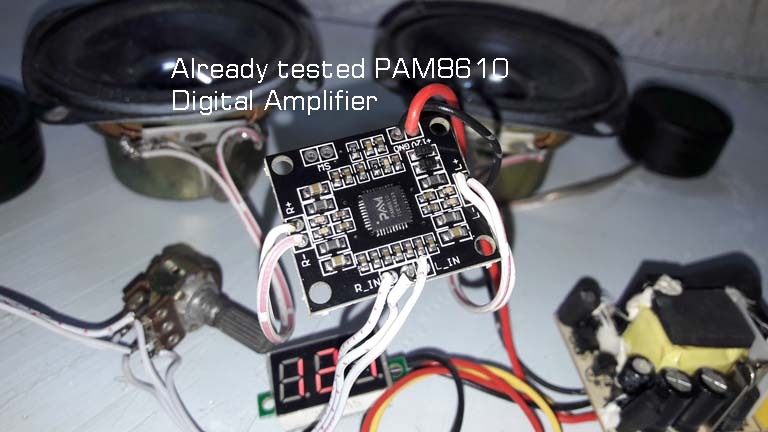 PAM8610 2x15W Stereo Digital Amplifier is a high-quality audio amplifier module that uses PAM8160 chip which can produce very clear sound and strong stereo separation. 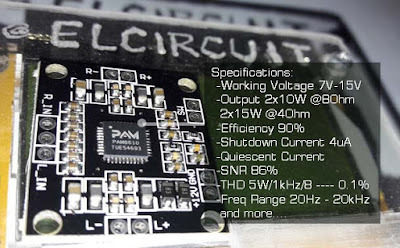 Working voltage: 7V - 15V. Output 2 stereo channel 2x10W (8Ohm) or 2x15W (4Ohm). Protection: Over Load, Over Temperature, Anti Popup Protection. 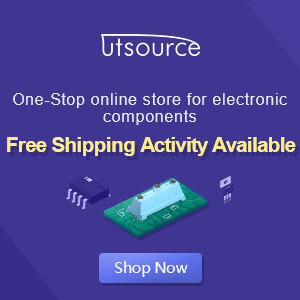 Using SMD components of high precision resistors, with tolerance of + - 1% 3. Layout of multi layer PCB with separate ground plane to ensure high S / N ratio, and low noise level. 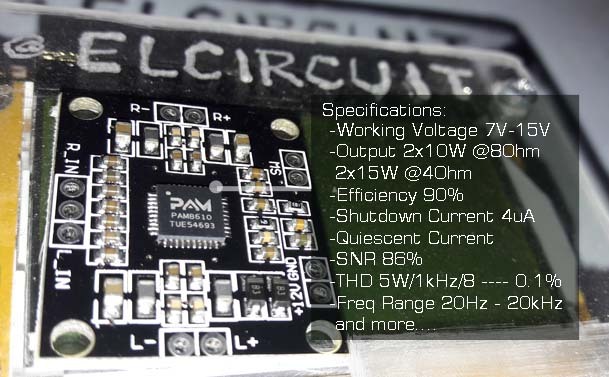 PCB using Fiberglass material with thickness 1.6 mm, double-sided board. Using capacitor power type Low impedance more dynamic sound. The first part of the power supply I use Switching Power Supply Unit with a 12volt DC output voltage ampere rating 1Amper, actual amperage rating that much less able to raise a voice of power amplifier PAM8610. 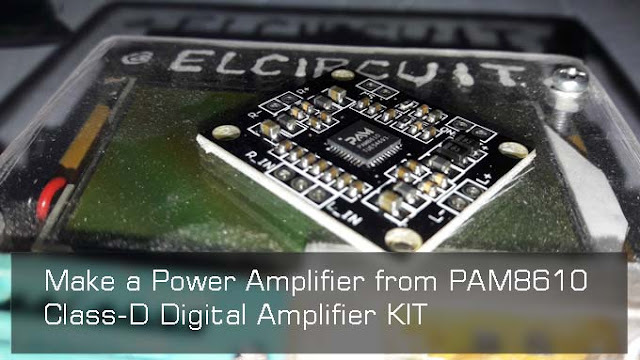 I add a digital voltmeter to monitor the supply voltage. 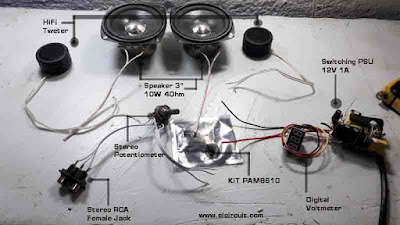 Then for the speakers use 2parts 3 Inch Speaker with 10W 4Ohm load power and also 2 pieces of tweter. For volume settings and audio inputs use a stereo potentiometer and an additional RCA input jack. 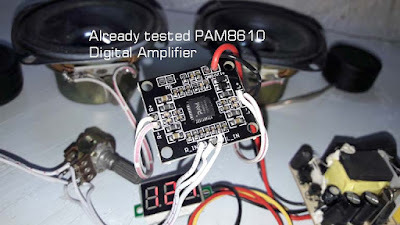 Power Amplifier using PAM8610 Class D.
I provide video in Indonesian version, following video build and test amplifier use PAM8610 Module. thanks phethai,, yesterday im visit your site.. Thanks.. This amplifier is the best one I've ever owned (that claim isn't worth very much) and I'm really, really happy with it. What does the SW on chip represent?